Khaled Hosseini's bestselling novel, The Kite Runner, revealed the beauty and agony of a tormented Afghanistan as it brought this little-known part of the world to the attention of readers. Now, in a richly illustrated graphic novel adaption (with text by the author), Hosseini brings his spellbinding story to a new generation of readers. It is a beautiful rendering of a story loved around the world. On Thursday, September 15th at 7:00 pm, Khaled Hosseini will discusses The Kite Runner Graphic Novel ($19.00 paperback) at Dominican University of California (Angelico Hall) in San Rafael, California. Please join us at this special Book Passage sponsored event. More info and tickets here. 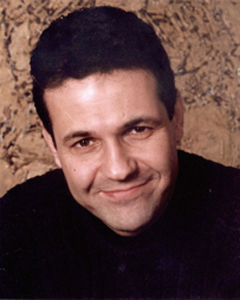 Khaled Hosseini was born in Kabul, Afghanistan, and moved to the United States in 1980. He is also the author of A Thousand Splendid Suns, and has been named a United States goodwill envoy to the United National Refugee Agency. Recently, Book Passage contributing blogger Zack Ruskin spoke with Hosseini about his new book. Their conversation follows. 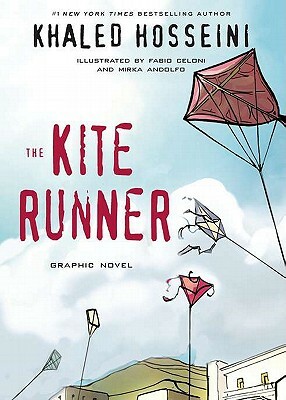 Zack Ruskin: How did the idea to adapt The Kite Runner into a graphic novel come about? Khaled Hosseini: I was approached to do it by my Italian publisher, Piemme. It was their idea, but it really caught my fancy as I have been a fan of comic books since childhood. I gave my go ahead and the search began for a set of artists to bring the story to visual life. Zack Ruskin: What was the collaborative process with illustrators Fabio Celoni and Mirka Andolfo like? Did you ever meet? Khaled Hosseini: I did not meet with them. Fabio and I did exchange an e-mail or two, but it was my intention to step out of the way and let his artistic instincts take over. He did send me pages as he progressed, both in black and white and some color samples as well. It was really exciting to see the sketches and to see the story shaping up visually. Zack Ruskin: While we’re talking about the art of the graphic novel, was it odd to see visible forms of characters you’d created solely in words? I know there was a film version of The Kite Runner, but the film features actors playing your creations, whereas the illustrated figures in the graphic novel are your characters. How did that transformation resonate with you? Khaled Hosseini: It is always odd to see another person’s interpretation of your thoughts, ideas, characters. For me there is always an element of curiosity, which existed in the film as well. I am curious as to what form the images that I tried to convey through words have taken in a reader’s mind. If that reader is an artist and can then translate his or her thoughts into drawings – or film or music or stage performance for that matter- then I am interested. It gives you a chance to see your own creation from a different angle, in a novel way. Zack Ruskin: In paring down the bulk of your prose into speech bubbles and short boxes of narration, how did you decide what to keep? Did some scenes just naturally lend themselves to visual alternatives while others clearly required dialogue to function? Did you find it necessary to draw storyboards as you went through the plot? Khaled Hosseini: I did not draw story boards. The aim was to use the existing dialogue in the novel to advance the story, complemented of course by Fabio’s artwork. Some of the dialogue has become familiar to readers of the book, and is essential to the story. Baba’s speech about sin, for instance, Rahim Khan’s ‘way to be good again’ line. In other instances, there were scenes that naturally lent themselves, as you note, to visual interpretation. For those, we did not need dialogue or narration at all and relied on imagery. I spent pages in the novel describing the kite fighting scenes, for instance, but Fabio did such a wonderful job of capturing the energy and excitement of the tournament, that there was no need there for much dialogue at all. 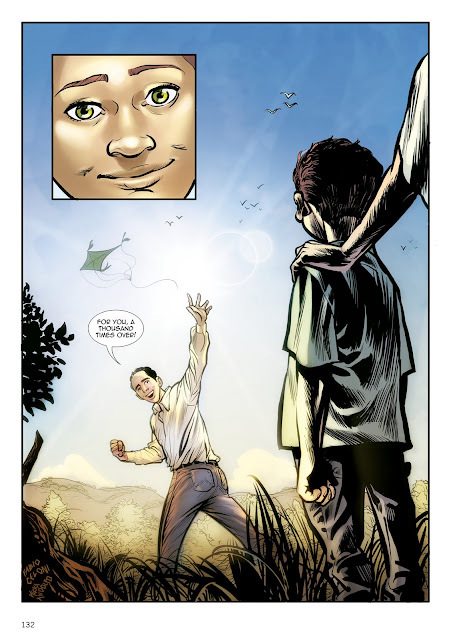 Zack Ruskin: Were you a graphic novel reader before you adapted The Kite Runner? Are you one now? Khaled Hosseini: Yes, I read comics when I was a boy. I began with Marvel and DC, read a lot of Batman, Daredevil, Spiderman, Iron Man, etc. Later on, I read most of Alan Moore’s work, Watchmen, From Hell, his take on the Swamp Thing. I read Frank Miller, especially his iconic take on the dark knight and also his terrific stint with Daredevil. I liked also Garth Ennis’ Preacher series. I read more ‘serious’ graphic novels as well, like Art Spiegelman’s Maus, and Marjane Satrapi’s Persepolis books, both of which are among my favorite novels, graphic or not. Zack Ruskin: Is your graphic novel intended to lure in readers who didn’t read the original release of your book? Will those that read your novel still gleam something new from the graphic version? 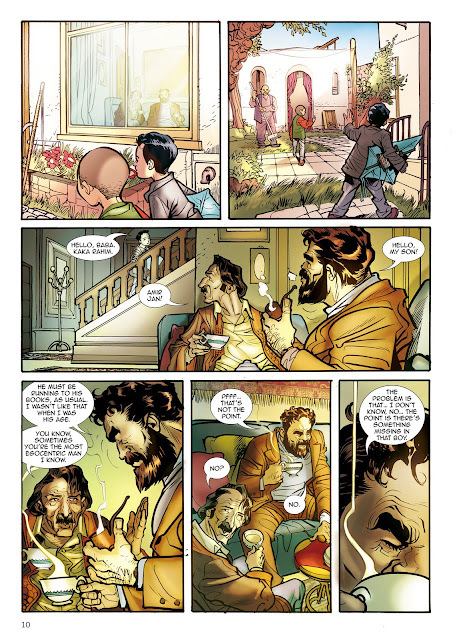 Khaled Hosseini: The graphic novel is intended for a wide spectrum of readers. This includes readers of the novel who may be curious to see the story depicted in a visual, artistic form. It includes younger readers who may not have read the novel but may pick up the graphic novel. Of course, it is also intended for fans of graphic novels, whether they have read the original novel or not. My hope is that this graphic novel, and Fabio and Mirka’s terrific artwork enhances the story for the readers and lends an additional dimension to the reading experience to readers both familiar and not with the original novel. Zack Ruskin: Are you considering adapting A Thousand Splendid Suns next, or were there particular reasons you felt The Kite Runner would benefit from a graphic retelling? Khaled Hosseini: At this time, there are no plans afoot to adapt A Thousand Splendid Suns into a graphic novel. I thought The Kite Runner would benefit from a graphic retelling because it is a very visual story, from the setting in Kabul, both pre and post conflict, to the kite fighting, etc. I thought that in the right artistic hands, it could turn into a beautiful visual retelling, and I believe Fabio and Mirka’s work has truly achieved that. Zack Ruskin: The concept of turning fiction prose into graphic novels is quite popular at the moment. In addition to modern authors like you, publishers are taking classics by writers like Austen and Dostoevsky and putting out comic versions. Why do you think graphic novel versions of works are so popular at the moment? Do you see any downside to offering “masterpieces” in altered forms? Khaled Hosseini: I don’t see any downsides. The graphic novel does not negate or taint the original work. The original work is always there, ready to be picked, and enjoyed in its original form and intention. The graphic novel is merely another way of experiencing the story. And I do think that people are interested today in experiences stories through many different formats, be it film, traditional comic books, mobile comics, webisodes, etc. There are now more options available today to readers than ever before and more readers who are open to different forms of reading experiences. Zack Ruskin: Having adapted a novel into graphic form, do you have any interest in writing a wholly original graphic novel? Can you think of some ideas for fiction you have that might best be told in that medium? Khaled Hosseini: At this point, that is not something that I have given much thought to, though my initial instinct is that it is an appealing idea and something that I would love considering doing down the line. Signed 1st edition copies of Khaled Hosseini's The Kite Runner Graphic Novel ($19.00 paperback) will be available through Book Passage following the author's September 15th event. Click on the above link to purchase a copy.